I admit that this is my bias as I really like the bromance between them. Kim Jong Kook and the Two Kids. I like their different styles blend in together in a song. It might sound a little messy and all over the place, especially when there are three voices in a song. Particularly Haha reggae style was overpowering, but I think it was a great attempt for them to work together. It was not an easy feat to have rap, reggae and ballad style in a song. They were considered one of the best korean singers of all times. During the early 20's this group of singers were very popular and well received for their great vocals. How nice it is to have both uncle and niece collaborating in a song. Kim Jong Kook seldom collaborate with other artise but Soya has the honor to do so as his niece. Both of them have great chemistry and their voices complement each other. Kookie is the vetern singer and Soya is a fresh artise with her own style. I like this song very much. 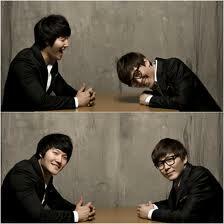 Gary and Kim Jong Kook complement each other very well. Gary does well in rapping and Kim Jong Kook does well in the chorus. Both of them deserved a pat on their shoulders for delivering a master piece. I heard that they know each other for a long time. His Niece Soya also collaborated with them in music. Therefore, I was anticipating this song. It was good and I like Mighty Mouth unique style of rap.